Country music's original outlaw, Bobby Bare, has a long list of accolades: he’s a member of both the Country Music Hall of Fame and the Grand Ole Opry, he’s celebrating a 60-year career, he’s had over 50 successful hits and he even hosted his own television show in the ‘80s, “Bobby Bare and Friends.” More than 30 years later, Bare is announcing a new podcast of the same name featuring conversations with Jamey Johnson, Trace Adkins, Jessi Colter, Ray Stevens, Billy Joe Shaver, Joe Ely, Delbert McClinton, Bill Anderson and more. “Bobby Bare and Friends” launches today on podcast networks and on wsmonline.com. 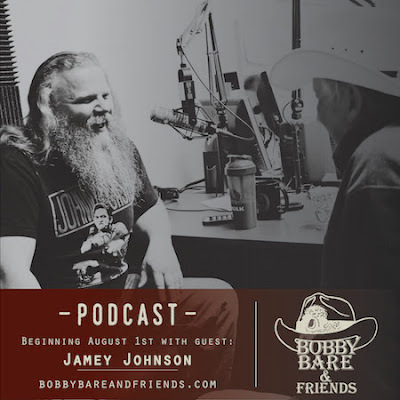 The debut episode features a conversation with a new generation of “outlaw,” Bare’s good friend Jamey Johnson. Eleven-time Grammy-nominated singer-songwriter Jamey Johnson is “one of the greatest country singers of our time,” according to The Washington Post. He is one of only a few people in the history of country music to win two Song of the Year Awards – for “Give It Away” and “In Color”-- from the Academy of Country Music and the Country Music Association. In addition to his own recordings, he has written songs for George Strait, Willie Nelson, Trace Adkins, James Otto, Joe Nichols and others. Bare talks to Jamey about his influences, early days in Nashville and even finds out the “In Color” singer is mildly color-blind. “Bobby Bare and Friends” is produced by 650 AM WSM in association with 117 Entertainment. Go to BobbyBareandFriends.com for more. New episodes will be released twice a month and will air on Route 650, 650 AM WSM's Americana centric digital streaming station, at 3 p.m. CST on release days along with highlights being played throughout the week on the historic radio station itself.